Robotic Mars probe, consisting of an orbiter, a lander and a rover. Launch planned for Q3 2021 and soft landing on Mars in 2022. Type: Unmanned mars probe. Programme: China Mars exploration. Agency: CNSA. Primary contractor: CAST. Status: In development. First launch: exp. 2021. On 11 January 2016, the Chinese government officially approved a robotic probe mission to Mars, following an 8-year pre-research. The mission will launch a Mars probe, consisting of an orbiter, a lander, and a rover, in the third quarter of 2020. The probe will conduct a soft-landing on Mars in 2021, when the Chinese Communist Party celebrates the 100th anniversary of its founding. The mission was said to have been personally endorsed by Xi Jiping, the Chinese President and General Secretary of the Chinese Communist Party. According to the SASTIND/CNSA, the probe will first enter the Mars orbit, before sending the lander to soft-land on Mars surface and deploy the Mars rover to explore the surrounding area of the landing spot. The orbiter will continue orbiting Mars to survey its surface and also provide data relay service for the lander and rover. The landing spot is expected to be between 5° and 30° north of the Mars Equator. The mission won’t be an easy ride, given the technical hurdles and notoriously poor success rate in previous attempts to land on Mars. 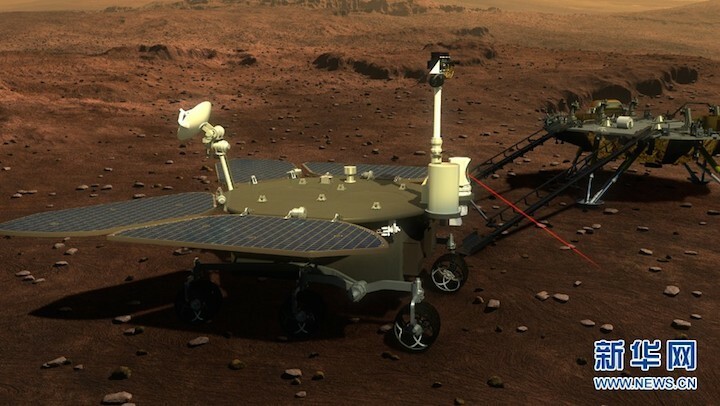 According to Zhang Rongqiao, the Chief Designer of the Mars mission, the long time-delay in communications means that the lander and rover must possess a high degree of autonomous operating capability. In addition, the weaker sunlight due to longer distance to the Sun and the Mars atmosphere poses greater challenge for the lander and rover’s power supply compared with a Lunar landing mission. The most challenging phase of the entire mission will be the atmospheric re-entry, which requires the lander to de-accelerate from about 26,000 km/h to below 1,500 km/h within several minutes. So far just over half of all attempts to land on Mars have succeeded. The limited launch window and long mission duration mean that there is only one chance to succeed. Once having successfully landed, the lander and rover will send back data on the red planet’s soil, atmosphere and other features, including any ice or water it may find. If the orbiting/landing mission is a success, China also plans to follow up with a Mars soil sample return mission in the late 2020s. Like China’s lunar exploration programme, the Chinese Mars exploration mission is also overseen and managed by SASTIND, an agency under the Chinese Ministry of Industry and Information Technology (MIIT). The agency, responsible for China’s civilian space programme, often uses the name of “China National Space Administration” (CNSA) in its exchanges with foreign space agencies. The primary contractor for the Mars mission is the China Aerospace Science & Technology Corporation (CASC), with all of its three spacecraft R&D subsidiaries involved. The Beijing-based China Academy of Space Technology (CAST, or the 5th Academy) is the primary contractor for the Mars probe system, as well as the designer for the lander and rover. The Shanghai Academy of Spaceflight Technology (SAST, or the 8th Academy) is responsible for the orbiter and some other sub-systems. The Beijing-based China Academy of Launch Vehicle Technology (CALT) is the primary contractor for the CZ-5 launcher system. The Mars probe will consist of an orbiter, a lander, and a rover, launched directly onto Earth-Mars transfer orbit atop a CZ-5 heavy-load launcher rocket from the Wenchang Space Launch Centre in Hainan Island. The launch window will be set between July and August 2020, and the probe will arrive at Mars about seven months later. Like previous Mars landing missions, the Chinese Mars lander will also employ hypersonic re-entry to de-accelerate, before deploying parachute(s) to further slow down. This will then be followed by a powered descent to finally soft-land the Mars surface. If the landing is successful, the Mars rover will then be deployed to explore the surrounding areas of the landing spot. The six-wheeled rover, which has a mass of 200 kg, carries a total of 13 pieces of scientific equipment including remote-sensing cameras and radar to explore the surface and undersoil of the planet. The rover is powered by four solar panels and has a designed life of 3 Martian months (92 Earth days). The Mars orbiter is designed to carry remote-sensing payloads to survey the surface of Mars from orbit, as well as providing communication relay with Earth for the lander and rover. China has provided a rare update on the progress of its 2020 mission to send an orbiter, lander and rover to Mars, stating that simulated landing tests have taken place as part of preparations. The tests were carried out recently by the Beijing Institute of Space Mechanics and Electricity (BISME), which focuses on landing technology among other specialised fields. The 2020 mission will be China's first independent interplanetary mission, and while the country successfully soft-landed the Chang'e-3 on the Moon in 2013, some of the challenges posed by touching down safely on Mars are greater, requiring new technology. BISME performed the trials at a specially developed but undisclosed site, with drop tests undertaken using a tower. 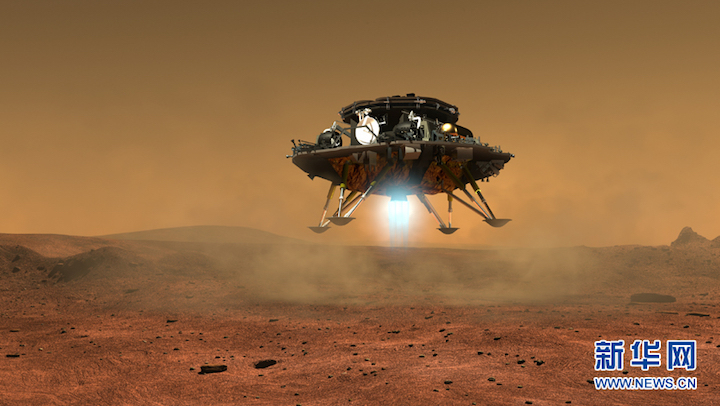 Testing a soft landing on Mars while on Earth required simulating the gravitational field of the Red Planet, as well as mimicking the attitude and speed of the lander as it goes through stages of entry, descent and landing (EDL) on Mars. The China Aerospace Science and Technology Group (CASC), the country's main space contractor and parent group of the China Academy of Space Technology (CAST) to which BISME belongs, announced in a terse statementthat 16 formal tests were completed successfully, including land stability. These provided effective data and laid a "solid foundation for the subsequent exploration and development of the deep space exploration of Mars", according to CASC. At the same time another CASC subsidiary, the Academy of Aerospace Propulsion Technology, announced that an important breakthrough in the propulsion subsystem for the Mars lander had been made in January. The developments follow a 2016 test of an experimental supersonic, low density parachute, which was launched into the upper layers of Earth’s atmosphere to substitute for Martian conditions. 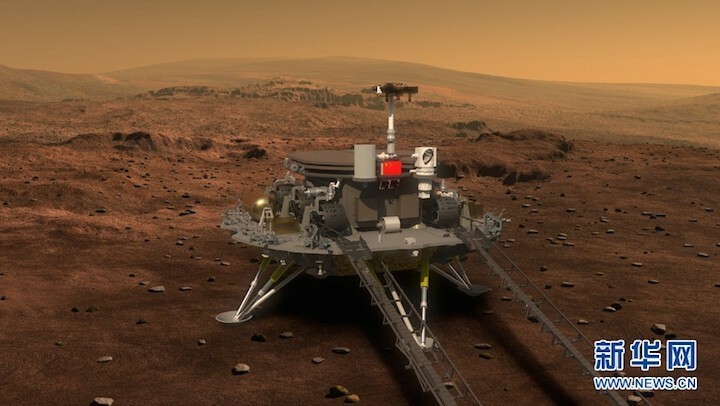 The mission will be ambitious in that China will attempt to combine an orbiter with a lander and rover for its first attempt at a Mars mission, when the success rate internationally for attempting either is just over 50 percent. A Long March 5 heavy-lift rocket will be used to launch the mission from the Wenchang Satellite Launch Site in summer 2020, arriving in spring 2021. The orbiter will initially support the work of the rover, which has an expected operational lifetime of three months, before switching to Mars observation. The landing segment will make use of gasbag, parachute and reverse thrust engines to set it down safely, while factors such as the long-distance data transmission delay mean that the rover will have a high autonomy. China will use some of the experience and technology from the Chang'e-3 mission for the much trickier Martian landing. However Ye Peijian, a senior figure within China's space programme, states that the greater velocity, the thin but hazardous Martian atmosphere, and the remoteness of the planet pose addition hurdles. The orbiter, lander and rover will, in combination, carry 13 payloads. The orbiter will carry both a medium and a high-resolution camera, which will boost understanding of the Red Planet and help with planning for future missions. The rover will carry a ground penetrating radar, a similar instrument to that which allowed China’s Yutu rover to image around 400m below the lunar surface and makie intriguing discoveries about the composition and history of the Moon, such as evidence of volcanic floods. Another instrument expected on the orbiter is a spectrometer calibrated for detecting methane, the presence of which may indicate biological processes occurring on Mars. China is also planning an audacious Mars sample return mission, which could launch in the late 2020s. The plans are part of a road map for deep space exploration outlined by China last year. While the 2020 mission will be China's first attempt at an independent mission to Mars, a joint effort saw Yinghuo-1 piggyback on Russia’s exciting Phobos-Grunt mission to return samples from one of the moons of Mars in 2011. The spacecraft failed to leave Earth orbit, however.